Are Drillers Showing More Interest in Deepwater Than Shale? Shale fields have so far helped America make it to the top spot in the list of big oil producing nations. Advanced techniques like hydraulic fracturing and horizontal drilling primarily backed domestic drillers in revolutionizing crude production. However, extracting oil from shale rocks through fracking is expensive and demands expertise. Recently, production from a few shale plays, especially the Permian Basin, has exceeded transportation capacities leading to a pipeline bottleneck problem. Thus, it is clearly time for oil drillers to focus on the more lucrative deepwater drilling. Although huge oil reserves are trapped under the seabed, exploring under the water is quite risky and demands specialized knowledge along with advanced rigs and floaters. Hence, it is quite surprising that deepwater drilling has emerged as a better alternative amid recovering oil prices compared to domestic shale plays. It is time upstream energy players focus more on oil discoveries as the global reserve replacement ratio has been steadily falling over the past several years. 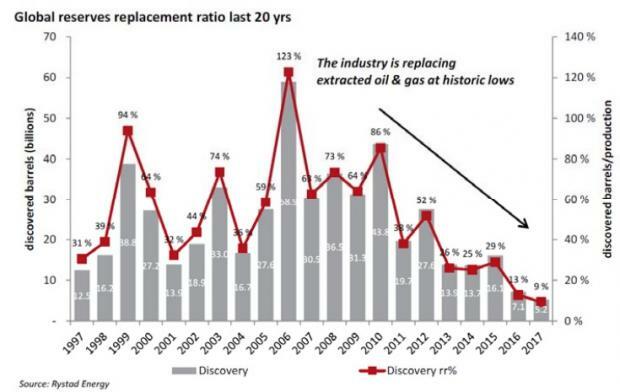 Explorers are not replacing their reserves despite a continuous increase in global crude oil production. Per the presentation by Transocean Ltd. RIG at Susquehanna Energy Conference, the percentage of oil production that the industry has been replacing with new discoveries is approaching a historic low. The source also reveals that production in the offshore resources has been replaced by explorers by only 33.3%. Since offshore resources contribute to almost 30% of worldwide production — according to Ensco plc ESV — there is an urgent need for more offshore exploration to make up for the deficit in production replacement. Oil price has a positive correlation with offshore project approvals, according to data compiled by Ensco. The massive recovery in crude prices is reflected in the rising approvals for offshore developments. Per a presentation by Ensco, the number of sanctioned projects in the offshore regions more than doubled in 2017 from 2016 and the picture is pretty encouraging for 2018. In its presentation at Susquehanna Energy Conference, Transocean said that it expects a total of 87 floater programs, representing as high as 59 rig years, to be awarded all over the word in the next 18 months. Notably, Ensco foresees roughly 10% of compound annual growth rate in offshore capital spending through 2027. The acceleration in spending will likely drive the rate of global rig utilization. Recently, Royal Dutch Shell plc RDS.A told Financial Times that the breakeven oil price for deepwater drilling has dramatically decreased to $30 a barrel. Moreover, the presentation by Ensco clearly showed that the breakeven oil prices for several offshore projects are less than $40 per barrel, significantly below the latest Brent crude price of $71.33 a barrel. In comparison, almost all the leading shale plays in the United States are witnessing significantly higher breakeven oil prices. Per Bloomberg New Energy Finance, the breakeven prices for Eagle Ford East, Eagle Ford West, Three Forks (Bakken), STACK (Anadarko), SCOOP (Anadarko) and Niobrara (DJ Basin) are $48, $61, $56, $58, $66 and $63, respectively. The data clearly shows that offshore drilling, which was once expensive, has evolved over time and has become more economical than operating wells in the shale play. We would want investors to keep a track on the following offshore drillers that are positioned to see an improvement in deepwater drilling businesses. Based in Steinhausen, Switzerland, Transocean Ltd. is one of the world’s largest offshore drilling companies with a technologically advanced and versatile fleet.The company’s strong backlog, which stands at $11.7 billion as of July 2018, reflects steady demand and an unmatched level of earnings and cash flow visibility. Presently, the stock carries a Zacks Rank #3 (Hold). Headquartered in Houston, TX, Diamond Offshore Drilling, Inc. DO is among the leading offshore contract drillers. The company, with technologically advanced offshore drilling units, serves all deepwater projects in the world. Total contracted project backlog — as of Jul 1, 2018 — was recorded at $2.2 billion. The stock currently carries a Zacks Rank #3. Rowan Companies plc RDC, based in Houston, TX, with its high specification jackup rigs is the leading provider of safe and efficient drilling services to prospective deepwater wells. The stock carries a Zacks Rank #3. Ensco plc, headquartered in London, is also ranked among the leading offshore contract drillers with the latest fleet of ultra-deepwater rigs. As of Jun 30, 2018, the Zacks Rank #3 company recorded contracted revenue backlog of $2.3 billion.